Enbridge Inc. (TSX:ENB)(NYSE:ENB) (the "Company") today announced it has agreed to acquire a 50% interest in Éolien Maritime France SAS ("EMF"), a French offshore wind development company, for an investment of CAD$282 million inclusive of transaction costs and past and future pre-Final Investment Decision ("FID") development costs. EMF will be co-owned with EDF Energies Nouvelles ("EDF EN"), a subsidiary of Électricité de France S.A. ("EDF") dedicated to renewable energy. Closing of the acquisition is expected to occur on or about May 19. 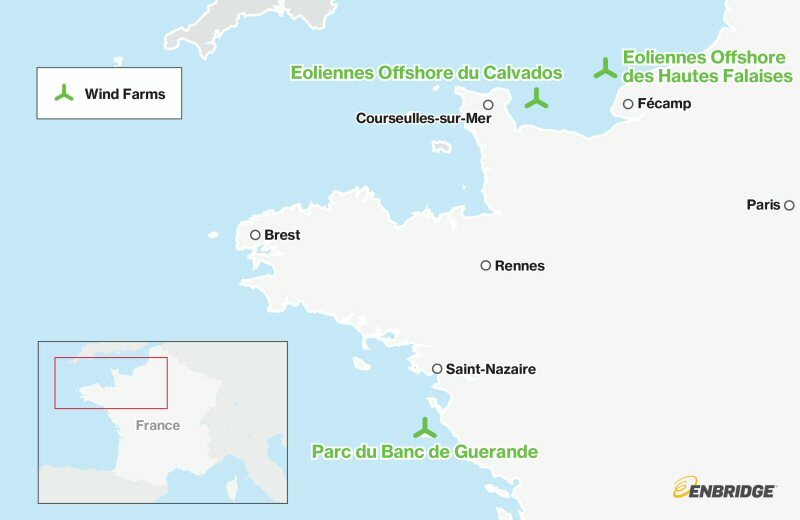 Enbridge and EDF EN will co-develop three large-scale offshore wind farms off the coast of France that would produce a combined 1,428 megawatts (MW) of power. Development of the three projects is already underway; however construction is still subject to FID and regulatory approvals. "This is a unique and strategic opportunity for Enbridge to further grow our investment in renewable power and build on our existing presence in European offshore wind generation. This investment in EMF advances our priority to build new business platforms that will extend and diversify growth," said Al Monaco, President and CEO of Enbridge. "The EMF development opportunities are underpinned by strong market fundamentals and a commercial framework that is very well aligned with our low-risk business model. Once fully operational, they are expected to generate attractive returns and accretion to available cash flow from operations." Each of the three wind projects has been awarded a 20-year Power Purchase Agreement (PPA) pursuant to which EDF, the power offtaker under the PPAs, will pay an indexed fixed price for 100% of the power generated by each facility and through which EMF will also be significantly insulated from variances in wind capacity. These three projects are in an advanced-stage of development with a permitting process close to completion, and significant technical and environmental studies already performed. Front-end engineering and design has been completed, construction contracts tendered and bids received. Subject to Enbridge taking positive FID on each project individually, the Company would potentially invest up to CAD$4.5 billion in total for all three projects. Should the projects achieve FID, construction would start gradually from 2017 and continue the next five years through 2022. The initial investment in EMF was included in the Company's previously announced secured growth program and will be funded from available liquidity. No incremental equity funding will be required. The incremental equity and debt required to construct the projects will be sourced once FIDs have been made. EMF is pursuing non-recourse project-debt financing for the debt component of the investment. Enbridge is co-owner with EDF Energies Nouvelles' Group, in four operating onshore wind projects in North America. Enbridge has interests in 24 renewable energy facilities, either operating, secured or under construction, with a net generating operating capacity of nearly 2,000-MW. The projects in operation produce enough gross power to supply power to more than 750,000 homes. During the past decade, Enbridge has invested nearly CAD$5 billion in renewable power generation and transmission. 498-MW Eoliennes Offshore des Hautes Falaises offshore wind farm, located off the coast of Fecamp, France. 450-MW Eoliennes Offshore du Calvados project, located off the coast of Courseulles-sur-Mer, France. 480-MW Parc du Banc de Guerande project, located off the coast of Saint-Nazaire, France. Enbridge Inc., a Canadian company, exists to fuel people's quality of life, and has done so for more than 65 years. A North American leader in delivering energy, Enbridge has been ranked on the Global 100 Most Sustainable Corporations index for the past seven years. Enbridge operates the world's longest crude oil and liquids transportation system across Canada and the U.S., and has a significant and growing involvement in natural gas gathering, transmission and midstream business, as well as an increasing involvement in power transmission. Enbridge owns and operates Canada's largest natural gas distribution company, serving residential, commercial, and industrial customers in Ontario, Quebec, New Brunswick and New York State. Enbridge has interests in nearly 2,000 megawatts of net renewable and alternative generating capacity, and continues to expand into wind, solar and geothermal power. Enbridge employs nearly 11,000 people, primarily in Canada and the U.S., and is ranked as one of Canada's Top Employers for 2016. Enbridge's common shares trade on the Toronto and New York stock exchanges under the symbol ENB. For more information, visit www.enbridge.com. Certain information provided in this news release constitutes forward-looking statements. The words "anticipate", "expect", "project", "estimate", "forecast" and similar expressions are intended to identify such forward-looking statements. Although Enbridge believes these statements are based on information and assumptions which are current, reasonable and complete, these statements are necessarily subject to a variety of risks and uncertainties pertaining to project development, construction and completion, operating performance, regulatory parameters, weather, economic conditions, commodity prices and the renewable energy market. A further discussion of the risks and uncertainties facing the Company can be found in the Company's filings with Canadian and United States securities regulators. While Enbridge makes these forward-looking statements in good faith, should one or more of these risks or uncertainties materialize, or should underlying assumptions prove incorrect, actual results may vary significantly from those expected. Except as may be required by applicable securities laws, Enbridge assumes no obligation to publicly update or revise any forward-looking statements made herein or otherwise, whether as a result of new information, future events or otherwise. This news release contains references to adjusted cash flow from operations (ACFFO). ACFFO is defined as cash flow provided by operating activities before changes in operating assets and liabilities (including changes in regulatory assets and liabilities and environmental liabilities) less distributions to non-controlling interests and redeemable non-controlling interests, preference share dividends and maintenance capital expenditures, and further adjusted for unusual, non-recurring or non-operating factors. Management believes the presentation of ACFFO provides useful information to investors and shareholders as it provides increased transparency and insight into the performance of the Company. Management uses ACFFO to assess the performance of the Company and to set its dividend payout target. ACFFO is not a measure that has a standardized meaning prescribed by U.S. GAAP and is not a U.S. GAAP measure. Therefore, this measure may not be comparable with similar measures presented by other issuers.